If we're to believe the predictions of futurists like Ray Kurzweil and Aubrey de Grey, we may be as little as a half-century away from halting the aging process and achieving indefinitely long lifespans. We may or may not get to that point - but it's fun to think about what we might want to do with all that extended life. So, assuming you could live as a semi-immortal, here are 17 to do with your added time. 1. 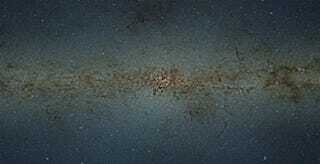 Tour the entire Milky Way Galaxy. You could visit every single solar system, planet, moon, and civilization (if they'll have you). While you're at it, dare your friends to go as close to a black hole as possible, watch the c-beams glitter in the dark near the Tannhäuser Gate, and visit a stellar nursery. And be sure to avoid those nasty gamma ray bursters. 2. Learn every single language on the planet. In addition to this you could include all the extinct and fictional ones. And then create your very own. 3. Watch evolution happen in real-time. One lifespan is simply not enough to watch a species morph into something completely different. With extended life, you could track your favorite evolutionary strain and watch it adapt to ever-changing conditions. Just brace yourself for that fateful day when your species goes extinct. 4. Walk the entire circumference of a Dyson Sphere. Ah, nothing like a leisurely stroll along the interior surface of an object that completely envelopes the sun. But don't forget to put on your hiking shoes - that's about 469,737,315 km (about 291 million miles). Hopping from panel to panel could also pose some problems, but I'm sure you'll figure it out. 5. Plug yourself into the orgasmatron. Permanently. 6. Upload yourself into a virtual reality and live an endless succession of alternative lives. Be sure to include simulations of historical figures, your friends, and as many lifeforms as possible - from tiny ants to extinct dinosaurs. 7. Ride the wave of continental drift. Just think, you'll be able to tell your friends about the time your house was on the other side of the Atlantic. This activity would work well in conjunction with watching the mountains rise and erode. 8. Insult everyone in the Universe in alphabetical order. With a hat tip, of course, to Wowbagger The Infinitely Prolonged. 9. Help raise your great-great-great-great-great-great-great-great-great grandchildren. Sensing there could be a generation gap. Or eighty. 10. Embark upon a ridiculously detailed (or mundane) megaproject. You could design and implement your own planetary ecosystem from scratch, compose a song that lasts a million years (with all due respect to John Cage's "As Slow As Possible"), manually count the number of grains of sand on a beach, or design the world's most complex Rube Goldberg machine. 11. Watch the Milky Way collide with the Andromeda Galaxy: Just be sure to go to the bathroom during the boring parts. Oh, and there's no rush - the show won't get started for another 4 billion years. 12. Work to achieve universal health care in the United States. Okay, some things might require more than one immortal lifespan. 13. Bury your own time capsule and dig it up a billion years later. Oh, the things you'll learn about your former, ancient self. 14. Achieve mastery in random pursuits. You could become a black belt in jiu-jitsu, a master at origami, a metallurgical engineer, a wine maker, and so on and so forth in that fashion and ‘till the end of time. Permutation City, here you come. 15. Watch all of humanity's monuments and structures weather away. It would be much like living through an episode of Life After People, but you could watch copper oxidize on public monuments, see statues erode, watch bridges collapse, witness the sinking of Venice, and be there when the plutonium in Chernobyl's radioactive core reaches its half life (about 24,400 years from now) - or better yet, be there in two million years when its neptunium-237 reaches its half life. 16. Attain enlightenment. Ommmmmmmm. For many of us, we're going to need all the time we can get. 17. Experience the end of the Universe first hand. Assuming it all ends in a Big Rip, the best part will be when all the atoms in your body explode outward at the speed of light (about 20+ billion years from now). Or, should it end in a heat death, you can look forward to the day when the nearest star is too far away to be seen. Then, after all the lights go out, and assuming you've found some miraculous way to still stay alive at this point, you'll have to contend with all that nasty proton decay (about 1034 years from now). Well, atomic structure is highly overrated anyway. On the bright side, you'll live in a universe that has achieved perfect thermodynamic equilibrium (your presence within it not withstanding). Top Image: European Southern Observatory. Inset mages: NASA, Cinema Advertising Council.